Do you ever feel like you are just too graceful and competent and good at what you do? Like your every action only serves to intimidate your friends and colleagues? Same! 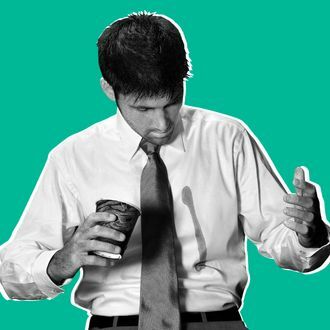 Lucky for us perfect people, Fast Company has a hot tip on how to quickly win trust from your inferiors: spill coffee all over yourself. To be fair, as the article notes, some professions really do come with this problem — therapists and psychiatrists, for example, must at once assure their new patients that they know what they’re talking about and make sure the patients are comfortable enough to open up to them. This happens over time, but there is a shortcut, and it is the aforementioned coffee thing. The study has been replicated many times over the years with similar results, and the lesson, as Galinsky and Schweitzer note, is that there are times when it can be helpful to show some vulnerability. But there’s a catch: This is only true if you’ve already clearly demonstrated your competence and credibility. And, of course, context counts, too. “Psychiatrists can build trust by spilling their coffee and saying, ‘I’ve never been very good with my hands,’” Galinksy and Schweitzer write. “Surgeons can’t.” No. No, they can’t.